Hi there! Today I’m spotlighting a new contemporary M/M romantic suspense novel coming August 26 from the writing team of Ari McKay. 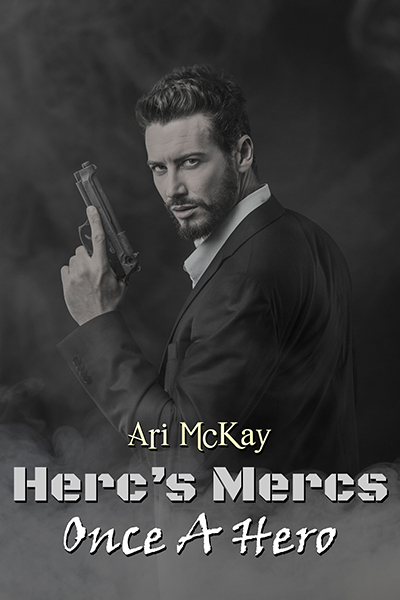 HERC’S MERCS: ONCE A HERO sounds like a good one! Check out the excerpt and giveaway below to find out more. Ezra Levin spent years as a soldier, just as his father had wished. But after stints in the Israeli military, the Mossad, and finally as a member of Hercules Security, the man once known as “Ghost” decides to retire and pursue his own dreams of being a chef. At forty-five, he knows his yearning to have a partner and a family of his own are probably unattainable, but as a private chef for Judge Mason Whittaker and his young son, Jamie, Ezra finds some measure of fulfillment. Unfortunately, Mason’s past as a District Attorney has made him a lot of enemies – one of whom seems to be looking for payback. When a series of unsettling events disturbs the Whittaker household, Ezra immediately steps up, wanting to protect Mason and Jamie. He calls upon his old friend, Cade Thornton, for help, as a cunning criminal plays a game of cat and mouse that endangers Mason’s life. Ezra realizes that Mason has come to mean far more to him than just an employer, and that he’s going to have to use all his old skills to stop a killer – or else he just might wind up losing the man he loves. Interested? You can preorder ONCE A HERO in advance of its release on 8/26 on Goodreads, Torquere Books, Amazon, and AllRomance. Click the Rafflecopter link below for your chance to win a copy of THE BIGGER THEY COME.